Whew! What happened. Last I knew I was going about my days, things doing all right, and then I was offered a bunch of work. I’ve been trying to play catch up ever since! It’s hard to complain when I have more work than I want, especially knowing so many who would give anything to have work, but at this point I need to slow down enough to catch up. Things are good with the weight loss. I’m down over 13 pounds in 20 days on this round, over 37 pounds in total since I started. I’m feeling good, and since I’ve started taking a bit of fruit with me in the mornings I haven’t had any further blood sugar issues. The dog is doing well. He has regained 2 1/2 pounds of the 3 that he had lost, and the vet was amazed at how fast he turned around. I’m glad I could put my nursing skills to good use, and he spent no time in doggie hospital. He also developed an eye problem and the antibiotic drops I was using weren’t helping. It turns out he had a dry eye, and twice a day drops of doggie restasis cleared that up literally overnight! Hopefully now he won’t come up with any other interesting problems, and things will be smooth for him for the foreseeable future. I still have work to do, but I’d rather go see what everyone else has been doing so I’m off to check on the other blogs I follow. 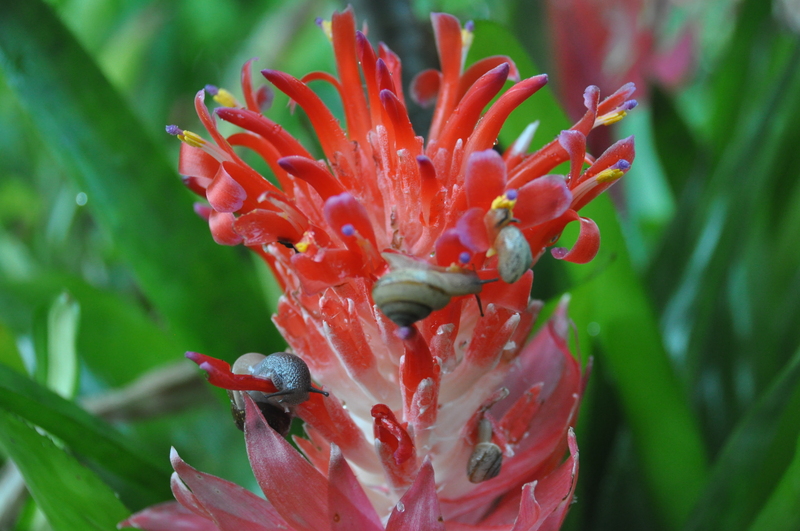 In keeping with my new theme, here’s a random photo – I spotted a bunch of snails munching on a bromiliad flower one day, and thought it made an interesting photo. This entry was posted in Diet, Dogs, HCG, Nature Photos, Photography, Weight Loss and tagged Diet, Dogs, Florida, HCG, Health, pets, Photography, Weight loss. Bookmark the permalink. I’m so glad that the fruit solved your blood sugar issue. That can be a tough one to get over. If your blood sugar is crashing, then you’re going to have a really hard time sticking to the diet. And congrats on the 37 pounds! LOL Yeah, I know. What can you do though? I usually turn up eventually.